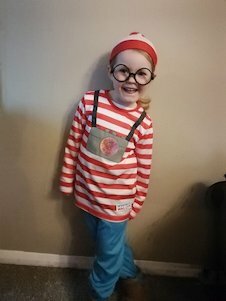 When we asked our Facebook and Twitter followers to send us photos of their children’s World Book Day costumes, we were blown away by the response! There were so many amazing entries, which made is very difficult to pick the winners. 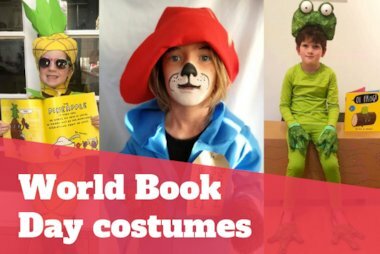 After a lot of deliberation, we are happy to present our World Book Day costume competition winners! We love this brilliant costume! The attention to detail and extra props made this a stand-out entry in our costume competiton. 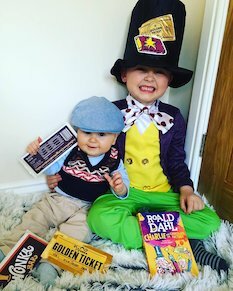 Roald Dahl books are a great source of inspiration for World Book Day costumes – from Charlie and the Chocolate Factory to The Twits to Matilda! You may know Quentin Blake as the illustrator of Roald Dahl’s fantastic stories, but did you know that he’s also written his own books? 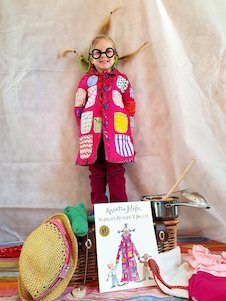 Angelica Sprocket’s Pockets by Quentin Blake is all about Angelica Sprocket and her never-ending pockets! What an inventive costume! We loved the amazing details on Matilda’s pockets – even the colours of each pocket are spot on. We really enjoyed all the references to the story as well, especially the alligator! 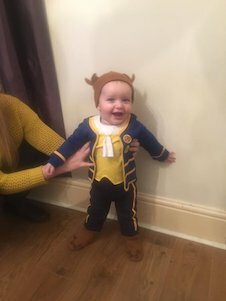 Beauty and the Beast is such a wonderful story, and we absolutely loved this Beast costume! 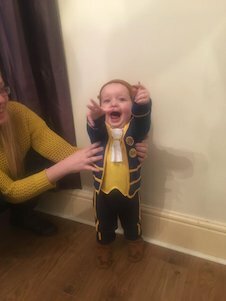 Despite being one of our youngest winners, he still managed to show off his impressive rarrrggghhh! 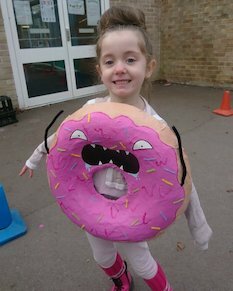 It can be difficult to come up with a completely unique costume for World Book Day, but we’ve certainly never seen a Doughnut of Doom costume before! This amazing homemade costume looks exactly like the illustrations in Elys Dolan’s brilliant picture book – very impressive. David Walliams’ hilarious stories are great inspiration for World Book Day costumes. We thought Autumn’s costume was fantastic! Clearly a lot of thought has gone into it, from the brilliant hair to the swag bag, complete with jewels. We were impressed that Autumn braved the snow to show off her amazing costume! What the Ladybird Heard Next is a much-loved story by classic picture book duo Julia Donaldson and Lydia Monks. 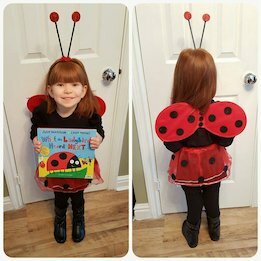 We loved Grace’s wonderful ladybird costume, complete with matching skirt and wings – plus antennae too. What a great idea! Where’s Wally? is an incredibly popular activity book series, and is a great choice for World Book Day costumes. It took us a while, but we managed to find Wally! Evie’s Where’s Wally? costume is really impressive, featuring a stripy top, trademark glasses, hat and even Wally’s camera! We were amazed by these thoroughly inventive costumes! 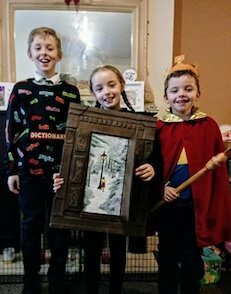 It’s clear that they’ve thought outside the box to come up with a walking dictionary, the wardrobe from the classic The Lion, the Witch and the Wardrobe and Horrid Henry dressed up as a king from one of our favourite moments in the much-loved Horrid Henry series. Not just one brilliant idea, but three! 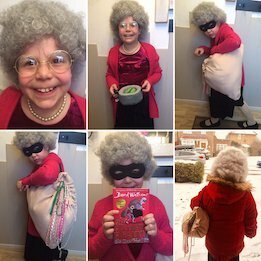 When we asked our Facebook followers to send us photos of their children’s World Book Day costumes, we were blown away by the response! There were so many amazing entries, which made is very difficult to pick the winners…. 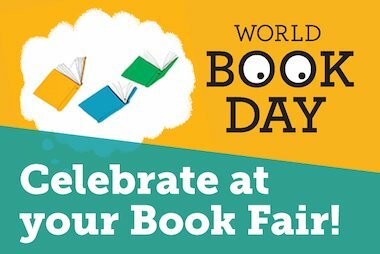 We accept World Book Day £1 tokens! 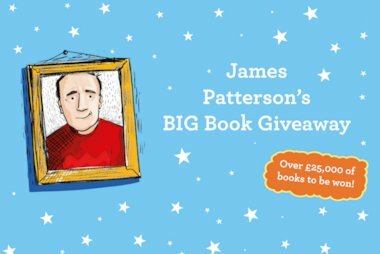 Did you know, if you’re holding a Travelling Books or Scholastic Book Fair, your pupils can use their World Book Day £1 tokens?